In its month long survey conducted in 2009 Americans for Sovereignty® found that the American people overwhelmingly rejected any taxation powers being granted to the United Nations. The survey was sent to over 30,000 people. In recent months the United Nations has developed what they call "a global regulatory framework for all financial services." But what this rhetoric really deals with are various schemes to tax international economic transactions. This includes such things as stock trades and any time someone converts the currency of one nation to that of another nation. The Americans for Sovereignty® survey found that over 90% of respondents rejected this plan. Instead the survey found that American citizens believed that any of these plans "to force new taxes on the U.S." would constitute an assault on American sovereignty. By using the funds raised from these new taxes to finance United Nations programs, it would allow the organization to have an endless source of funds and not be subject to annual appropriations from the U.S. Congress. Thus the United States would lose much of its leverage over the United Nations to restrict its efforts to expand global government as the expense of American sovereignty. 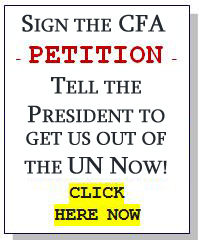 The survey also inquired about a previous proposal by then Senator Obama to devote a fixed 1-% of the U.S. budget to various programs of wealth redistribution.This proposal has been embraced by the United Nations, but rejected by 98% of those responding to the Americans for Sovereignty® survey. Finally the survey found that 95% of the people favored the complete withdrawal of The United States from the United Nations. Given the huge permanent and growing bureaucracy of over 50,000 people working at the UN, great concern existed that this can become a world government that threatens the sovereignty of the United States. Americans for Sovereignty® is a project of Council for America®. With over 25,000 supporters it is one of the largest organizations in the United States that focuses its attention on issues effecting continued American sovereignty. Through its surveys, petition drives, the Congressional Scorecard project and other educational programs, Council for America informs the public about growing international threats to American sovereignty and works to thwart such threats.